We all love our coffee. When we don’t get it, we can be a bit on the grumpy side of things. While there are those who don’t mind using any old coffee pot, others like to find new and inventive ways to brew their lifeblood. It can be brewed cold, hot, on the stove, over a fire, and however it is made, there always seems to be just the slightest variance in taste. Should you also be acquainted with canning food, then you likely have a few Mason jars lying around. If you wished you had a use for them year round besides cold drinks and storing food, then you’re going to love the Pour Mason. 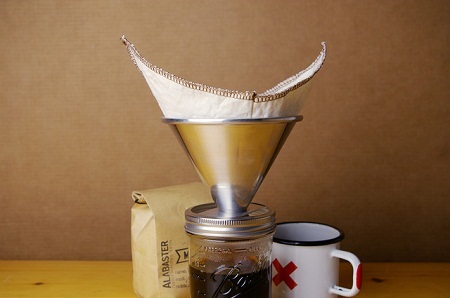 This is a Mason jar attachment that will allow you to brew coffee directly into a jar. It’s made of aluminum alloy, and can make single servings of your favorite coffee. Unscrewing this lid will not be very fun after you’re finished making your beverage, as the metal is going to be pretty hot for a while. You will want to make sure to get a coffee ‘sock’ to make sure the grounds don’t find their way into your drink. Actually, you will also want to make sure you have a Mason jar available, as well as coffee, as none of those items are included in the $35 price. Keeping that in mind, this is a pretty expensive way to make coffee. Unless you’re just a collector who wants every method of brewing coffee at your fingertips, it would likely be far wiser to get a regular coffee pot or French press.